I randomly decided to get a pet snake. Like, I woke up one day and decided to get it. Being a lazy geek, though, I ordered it over the internet. I did a bit of research to figure out what type of snake I wanted. Knowing I’d probably end up forgetting to feed it once and a while or not having the perfect temperatures for it all of the time, I ended up deciding on getting a California King Snake. It’s non-poisonous, will eat pretty much anything, and is fairly robust. I bought it as a tiny lil’ thing… In order to not freak out the FedEx delivery guy, though, the pet shop I ordered from (in New York) wrote on the box that it contained baby tree frogs. Nice. When I first got it, I was upset because I assumed there was a mixup at the pet shop. After I found the snake inside, though, I realized it’s probably best for the snake that the driver not know what’s in the box next to them… heh. 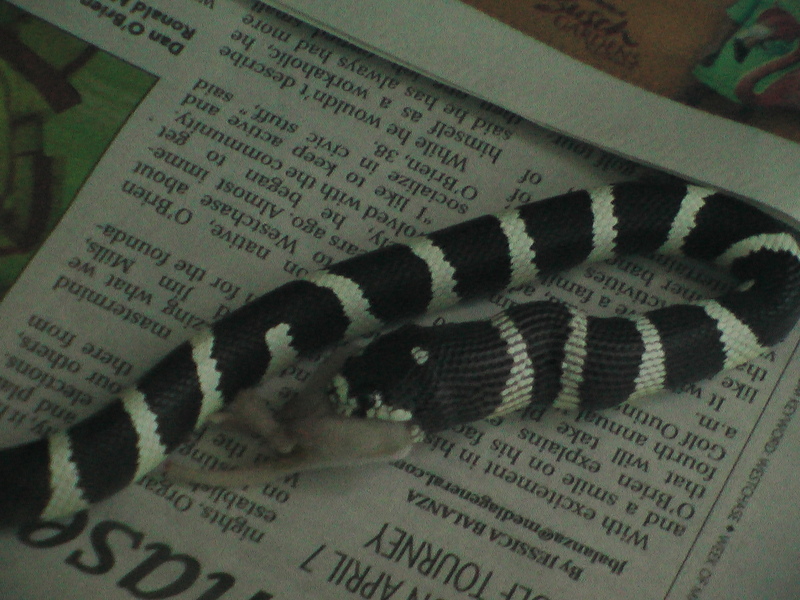 It’s pretty weird watching it eat, though… I feed it frozen mice. Well, I buy them frozen… I have to thaw them out in warm water before it can eat them. When I first got it, it was barely big enough to eat the crazy-small mice called “pinkies”. Now it’s finally big enough to eat “fuzzies”. Geesh… even when they are dead and frozen, they still sound cute. Hehe. Oh, well. A snake’s gotta’ eat, right? So far I’ve only gotten bitten once. At first I thought it was funny that it kept nibbling on my thumb a little. But once it latched on, it just wouldn’t let go. Once I finally got it off me, though, it hid for a day or so and wouldn’t come out. I guess it was cranky. Other than that, though, it’s been pretty low-maintenance. If it wasn’t so fast, I’d probably play with it a bit more. As it is, though, it likes trying to explore a bit too much when I let it out.